I’ve talked a lot about cooking after my husband and I got married, I think because it was such a pivotal point in my life, and I really learned to cook out of necessity, but also since cooking ended up (clearly) becoming such a huge part of my life. It’s funny, because in the (almost) 13 years that we’ve been married, my tastes have evolved and our budget has grown and now we have kids in the equation and hopefully I haven’t become a worse cook over time. But when I ask my husband what he wants me to put on the menu each week, his requests are pretty much always from those first few years of our marriage. Like this. This would have been his last meal, and, if we’re being completely honest, it probably still would be. Casseroles are funny because they’re notoriously hard to photograph, which is why I’ve never posted this recipe before, but they’re always among our most popular recipes. 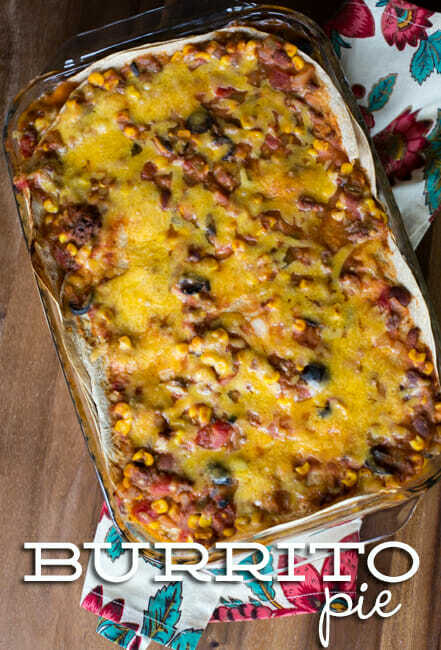 One thing I love about this particular casserole is that it’s hearty and filling and delicious and homey, but it’s not going to kill your calorie budget–in fact, the way I make it (with 93% lean ground beef and those Mission Carb Balance Tortillas), it clocks in at around 300 calories, 27 grams of protein, 16 grams of fiber, and 8 Weight Watchers Points Plus, which isn’t too shabby for dinner. To get started, you’ll need half a pound of extra lean ground been, a medium chopped onion, and a few minced cloves of garlic. Brown the ground beef in a large skillet over medium heat. 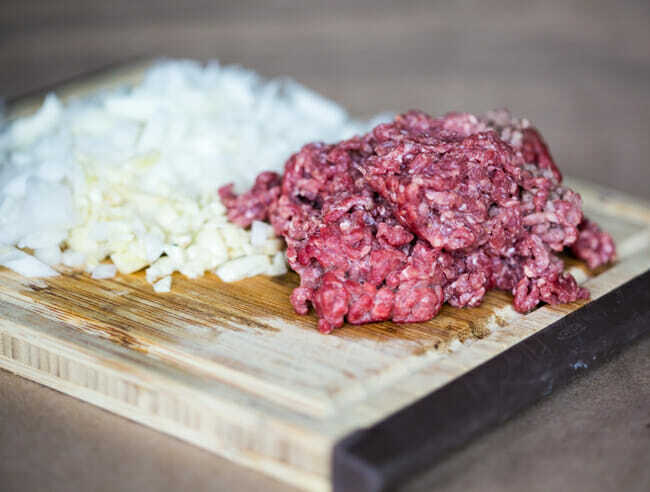 When the beef is about halfway cooked, add the onion and garlic and cook until the beef is cooked through and the onions and garlic are tender and fragrant. 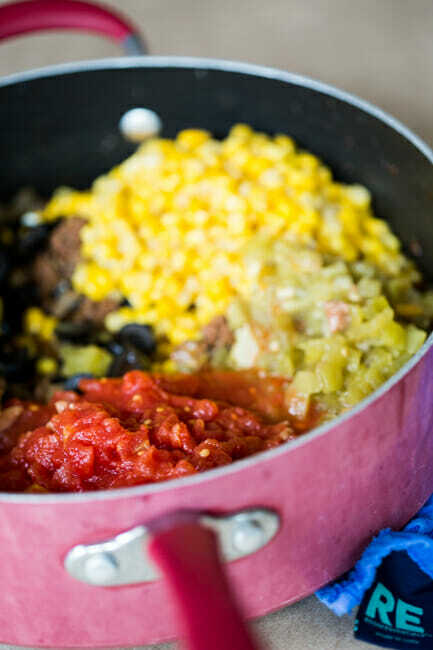 While the ground beef is cooking, round up your other ingredients–you’ll need taco seasoning, enchilada sauce, black olives, corn, fire-roasted green chilies, diced tomatoes with green chilies, and refried beans. 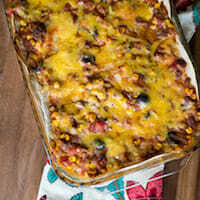 then add the black olives, chilies, tomatoes, corn, enchilada sauce, and refried beans. Spread about 1/2 cup of the mixture onto the bottom of a 9×13″ pan. Top with one whole tortilla and one half tortilla. then top with another 1 1/2 tortillas. 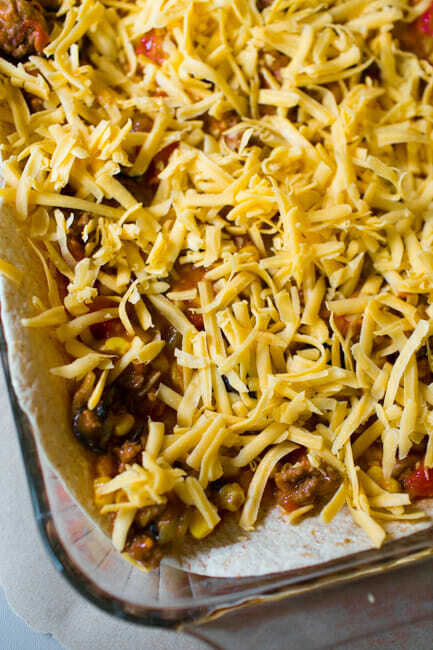 Repeat until you run out of tortillas, topping with a small amount of the meat mixture and another sprinkling of cheese. Bake for 25-30 minutes or until heated through and the cheese is melted and bubbly. Serves 12. You can serve with avocado slices, sour cream, and a squeeze of lime juice if you want. Brown the ground beef in a large skillet over medium heat. 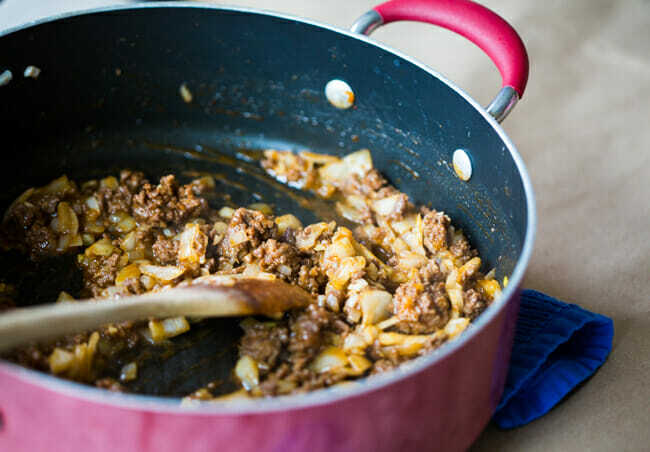 When the beef is about halfway cooked, add the onion and garlic and cook until the beef is cooked through and the onions and garlic are tender and fragrant. 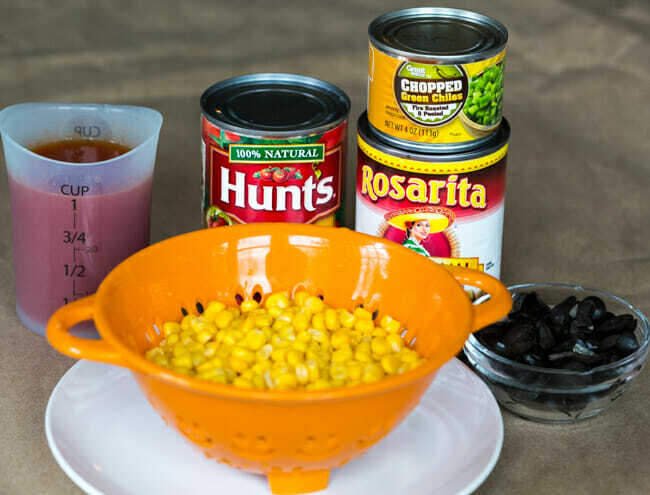 Add the taco seasoning and stir to coat completely, then add the black olives, chilies, tomatoes, corn, enchilada sauce, and refried beans. Bring to a simmer then remove from heat. Spread about 1/2 cup of the mixture onto the bottom of a 9×13″ pan. Top with one whole tortilla and one half. Spread 1 1/2 cups of the mixture on top of the tortillas, sprinkle with cheese, then top with another 1 1/2 tortillas. Repeat until you run out of tortillas, topping with a small amount of the meat mixture and another sprinkling of cheese. Bake for 25-30 minutes or until heated through and the cheese is melted and bubbly. Serves 12. My husband and I made something similar to this when we first got married, only with chicken and rice added; it was really tasty & satisfying at the time. Unfortunately we ate it so often that now, 8 years later we still can’t bear the thought of making it again. It’s funny how your experience with food can either make you crave it or abhor it for a long, long time. We have made a similar one with chicken and black beans. This would be a nice variation on that. Yum! Casseroles are funny. The fam either loves them or hates them. I think they’ll love this one and I will too because its easy!! =) Thanks Kate! We call this enchilada lasagna and add rice that’s got some lemon juice in it. I mix cheese sauce with sour cream and brush it on each tortilla before i stack it so you get their flavor in every bite. it’s an absolute favorite where I work! I buy ground beef in 1lb packages. Wonder if I could make two of these and freeze one of them? 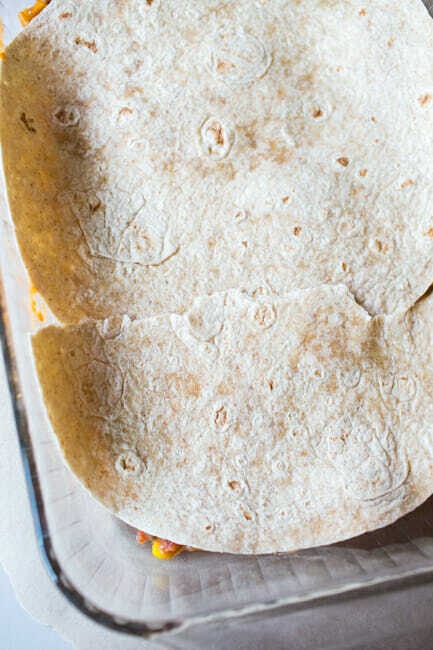 Think it would be good or think the tortillas would get too soggy? I’ve made a recipe very similar to this and had good results freezing it. Assemble it according to the instructions, but don’t bake it. Allow it to cool on your counter to just warm or even room temp, then wrap it in freezer safe wrap and freeze. Allow it to thaw overnight in the fridge the day you plan to serve it, and then bake it according to the instructions, adding about 10 extra minutes. Or, bake from frozen, but plan on that taking over an hour. If you bake from frozen, cover it with foil until the last 15 minutes so it doesn’t get too brown on top. I made this last night for dinner and it was so yummy! I had the same problem though – full pound of ground beef, large can of refried bean, large can of diced green chilies, so I doubled the filling and froze half of it. Next time I want to make it I just have to thaw the filling and assemble it. This sounds wonderful! What size pan do you use? I love that you post these “newly wed” recipes! I’m currently in that position–in school, just married, cooking for fun, small budget, trying to be healthy. We’ve loved everything we’ve tried from your site. Thanks for being awesome! Made this for dinner tonight. It was great! And everybody ate it (which is a miracle in our house). Thanks for the great recipe!!! Yay! I am making this tonight! Thanks so much! I have kids with food allergies and this recipe was so easy to adapt. I left out the cheese and used corn tortillas and it turned out great! I think it will become a regular at our house. This recipe is amazing! my family ate the entire tray for dinner, my husband was sad that he could not take any to work the next day for his lunch. Loved it! Thanks for posting points plus value. Made it for dinner last night, Kate. It was a big hit! I don’t care if casseroles don’t photograph well – keep ’em comin’!